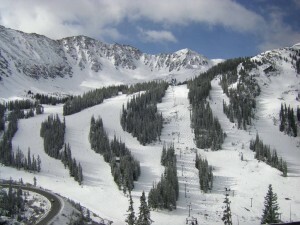 Arapahoe Basin, CO – The White River National Forest has accepted Colorado ski resort Arapahoe Basin’s 2012 Master Development Plan (MDP). New projects in the plan include a zipline tour, a surface lift for access to Montezuma Bowl, increased snowmaking reservoir storage, and lift-served skiing in The Beavers. “The MDP does an excellent job in identifying the existing and desired condition for the ski area and proposed improvements on the National Forest System lands within the permit boundary,” said Scott Fitzwilliams, Forest Supervisor for the White River National Forest. Acceptance does not imply authorization to proceed with construction or implementation of any proposed projects, however. In the coming months, Arapahoe Basin will initiate the environmental analysis and approval process that will include a full Environmental Impact Statement. During the analysis, A-Basin stakeholders will have opportunities to review and comment on the proposed projects.